U.S. based pharmaceutical giant Pfizer saw its profit for the third quarter plummet over 38% as bigger spending and large charges related to its acquisitions were able to more than offset its higher sales. The U.S. drug maker’s mediocre quarterly results missed expectations on Wall Street and it lowered its profit forecast on the top end for 2016. Pfizer also said it would scrap the developing of an experimental drug for cholesterol that has been highly touted. 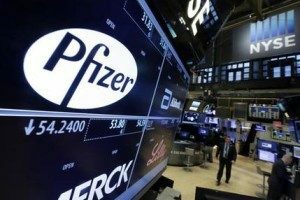 Following the announcement by Pfizer on September 26 that it would split into two separate companies as a way to accelerate its growth, a move that a number of analysts and investors hope would give a boost to the lagging shares at the drug maker, investors starting to sell shares. In trading before the opening bell on Tuesday, shares of Pfizer were down over $1.21 or approximately 3.8%. The Viagra and Lyrica pain treatment maker posted a $1.32 billion net income equal to 21 cents a share. That was in comparison to a net income of $2.13 billion equal to 34 cents a share for the same three-month period one year ago. Excluding charges that totaled more than $2.4 billion for restructuring and acquisitions, the company’s adjusted earnings were equal to 61 cents a share. Analyst’s estimates averaged 62 cents a share for adjusted earnings. Revenue, which had a great deal of help last year from Pfizer’s mega-acquisition of Hospira the injected drug maker, reached $13.05 billion during the quarter, which was up by 8%. Analysts on Wall Street were expecting the drug maker to have revenue reaching $13.06 billion. Pfizer, based in New York, has seen its spending surge to high levels, in part due to its own acquisitions. Cost of production soared by over 39%, and its spending for research and development and for administration and marketing were both up more than 9%. At the same time, Pfizer said it is expecting earnings for the full-year to end up between $2.38 and $2.43 a share, which is down from a forecast it released earlier this year of between $2.38 and $2.48 a share. Pfizer forecasted its revenue to be between $52 billion and $53 billion, which was a narrower range that the forecast it released earlier that was for between $51 billion and $53 billion.